← 2012 Olympics Golden Moments!!! Britains at it again!! Gold Gold Gold!! Well Olympic fever is back and we are smashing it again!! Making us proud to be British!! Here are some of our Great moments from last few days and there will be plenty more to come!! 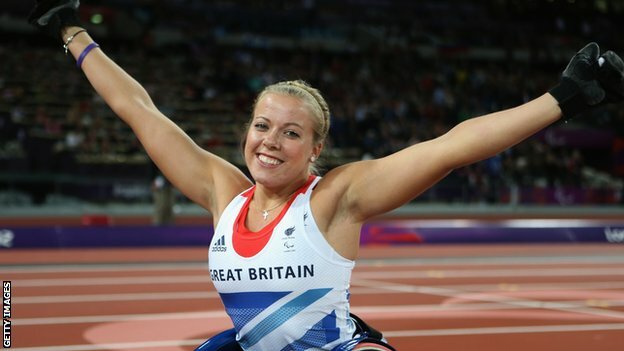 Hannah Cockroft won Great Britain’s first gold of the Paralympics track and field competition in London’s 2012 Olympic Stadium.The wheelchair athlete from Halifax burst clear after 60 metres to take the T34 100m title in a new Paralympic record time of 18.05 seconds!!!! The Yorkshire born athlete,set a new 100m world record of 17.60 in Switzerland this year, said she was confident of living up to her billing as the odds-on favourite good for her!!! Aled Davies secured Britain’s first athletics medal of the Games when he won bronze in the F42/F44 shot put. The 21-year-old amputee saved his best effort until the last of his six attempts, when he recorded 961 points. Here’s to more medals for Team GB!! This entry was posted in Olympics! !, Sports News!, Uncategorized and tagged 2012 Paralympics, Gold, Hannah Cockcroft. Bookmark the permalink.